Source Code, Duncan Jones' follow up to the brilliant Moon, was always going to be an interesting ride, as once again we're thrust into a confusing story, that has just enough emotional weight to stop us from caring about the questions that it leaves behind. People will pick holes in it. I'm sure of that. Any film with which takes it's 'time travel' seriously is going to have to be pretty tight to get past the internet geek squad. However the movie makes a nice side step early on to avoid much of that and, as is made pretty clear from the get go, Jake Gyllenhaal isn't time travelling at all. For those that don't know Captain Colter Stevens (Gyllenhaal) wakes on a train to find that he's not in his own body. The girl he's travelling with (the excellent Michelle Monaghan) thinks he's someone else and when he checks his reflection the face staring back at him his not his own. He's freaked out, naturally, and then the train blows up. Captain Stevens wakes in some sort of metal capsule, he's strapped into what looks like a seat from a plane and there's a small television screen with a woman talking to him. It transpires that he's been serving in Afghanistan but has been selected to work on a project called the Source Code. The train bombing has taken place earlier that day but he is being sent back into the memory of one of the passengers to try and discover who the bomber is because there has been the threat of another bomb later that day. He has the same eight minutes each time he returns to the train up until it explodes. The interesting stuff comes from Steven's confusion, his lack of memory between serving in Afghanistan and being in the capsule and whether his actions during the eight minutes on the train have any impact on the space time continuum. This is where Duncan Jones excels, because not only do you follow it, you root for the movie to get it right at the end. And when it does feel like it missteps near the conclusion it pulls it back with aplomb. The stand out is Vera Farmiga as the Air Force Officer communicating with Stevens through a camera. For most of the movie all we get to see is her head and shoulders but much is conveyed with sideways glances off screen as the character struggles to stay professional. She's the glue that holds the film together and it's a lovely understated performance from a great actress. The sense of urgency that the film tries to convey is lost because the film stays focused on Stevens, either on the train or in the capsule, the threat of a second bomb rarely feeling that significant. This isn't helped by a slightly over hammy Jeffrey Wright who's portrayal of the inventor of Source Code is at times jarring. For the most part though the movie holds together wonderfully well. For the geeks out there there's even a rather brilliant nod to the movies fore barer Quantum Leap. 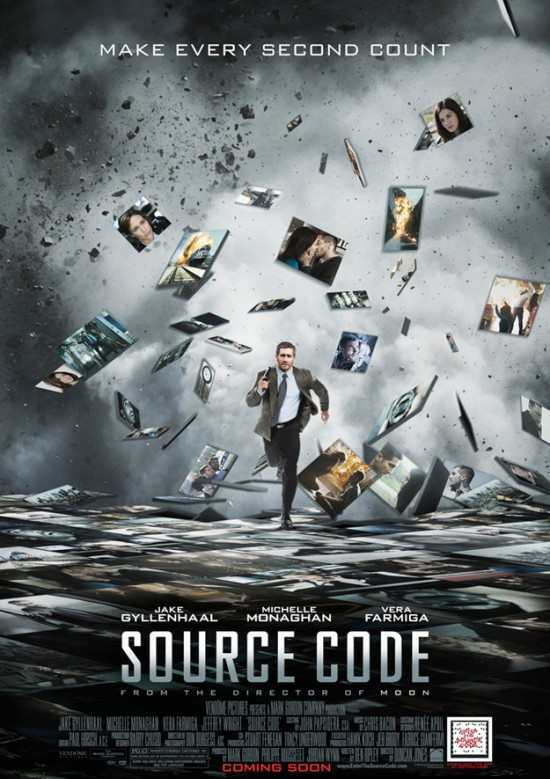 Source Code is a tight, beautifully put together film and Gyllenhaal does a great job as the protagonist, sharing our confusion initially but learning as we learn, the audience building its relationships with those around him as he does. You'll come out of the cinema scratching your head and five minutes later things will pop into your mind and an unanswered question will surface. And then another will follow. If you like your movies all neat and tidy this will initially feel like that, then in the car home you'll feel like you did at the end of Inception. But in a good way.